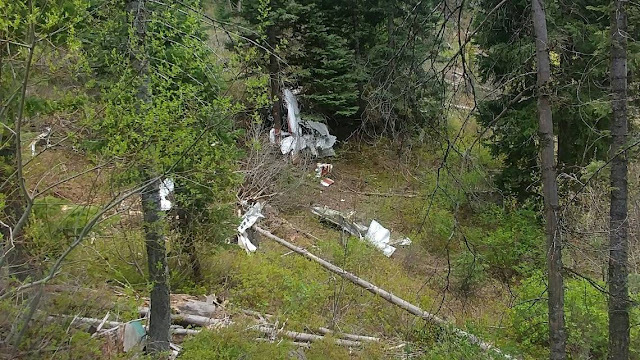 On May 13, 2018, about 1230 mountain daylight time, a Cessna 182G airplane, N2377R, was destroyed after it collided with mountainous terrain near Cascade, Idaho. The private pilot was fatally injured. The airplane was registered to and operated by the pilot under the provisions of Title 14 Code of Federal Regulations Part 91. Visual meteorological conditions prevailed, and no flight plan was filed. The flight originated from Boise Air Terminal/Gowen Field (BOI), Boise, Idaho about 1215 and was destined for McCall Municipal Airport (MYL), McCall, Idaho. The wreckage debris path was located in a wooded area approximately 41 nautical miles (nm) north of BOI and was oriented on a 195° magnetic heading. All major structures of the airplane were accounted for at the accident site. The initial impact point (IIP) was identified by two tree scars located about midway on a 70-ft-tall tree. The nose landing gear was located at the base of the IIP, and wing fragments were distributed along the wreckage path. A large ground scar was located about 50 ft forward of the IIP in the debris path. The main wreckage was composed of the empennage, right wing, main cabin, and engine, and was located approximately 110 ft forward of the IIP. The empennage was vertically oriented, and at rest against the right wing, which was beneath a portion of the cabin and instrument panel. Both propeller blades remained attached to the propeller hub; however, the assembly had separated from the engine crankshaft at the propeller flange. Nolan William Smith, born May 29, 1983 to Marsha Hatch Smith and Terrell F. Smith, died May 13, 2018 in the weather-related crash of his single engine airplane. He left this life doing what he loved and full of excitement and ambitious plans for the future. He attended schools in Kuna and graduated from Bishop Kelly High School in 2001. He was awarded a B.S. in Molecular and Cell Biology from the University of Washington in 2005. He was briefly in a PhD program in Cancer Biology at MD Anderson in Houston before turning to real estate appraising. He was a hard worker and excelled at everything he decided to do. In 2011 he went to work for Fannie Mae in Dallas. It didn’t take long for this fifth generation Idahoan to know that he had to come home. So he did and brought his job with him. He was blessed to enjoy the affection and companionship of many friends who engaged with him in the activities he loved: skydiving, mountain climbing, whitewater rafting, motorcycling, dirt biking, flying, snowboarding, snowmobiling, and any other adventure he could find. He is survived by his parents; his lady in life, Katie Lynn Strode; a brother, Preston (Jennifer); a niece and nephew; his second parents, Garry and Nancy Ames; his other brother, David Bloxham; grandparents, Alan and Ada Smith and Eugene F. Hatch; uncles, Martin Hatch and Kurtis Smith; aunt, Sharon Zitlau; cousins; and many good friends. He was preceded in death by his grandmother, Joyce Hatch; aunt, Sylvia Hatch; and uncle, Bradley Smith. There will be a visitation on Friday, May 18, 2018 from 6:00 – 8:00 p.m. at Cloverdale Funeral Home located at 1200 N. Cloverdale Rd. in Boise, Idaho. Services will be held at 2:00 p.m. on Saturday, May 19, 2018 at Cloverdale Funeral Home with graveside service immediately following. The family will greet friends prior to the service at the funeral home. A reception will be held from 4:00 – 6:00 p.m. at the Cloverdale Reception Center at the above address. Any condolences or tributes can be left at www.cloverdalefuneralhome.com. BOISE -- The wreckage of a small plane that went missing on a flight from Boise to McCall has been found, according to the Valley County Sheriff's Office. The plane was located in a remote mountainous area south of Smiths Ferry, and it has been confirmed by detectives that the pilot died in the crash. 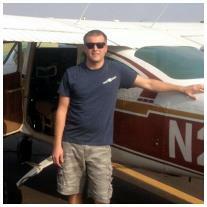 The pilot has been identified as 34-year-old Nolan W. Smith of Boise. He was the only person on the plane. The body has been retrieved from the crash site. 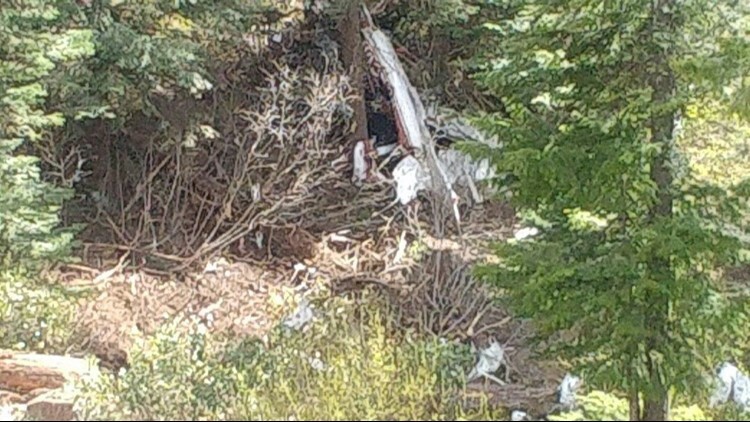 Authorities say the four-seat Cessna 182 left Boise around 12:30 p.m. Sunday but did not arrive in McCall as scheduled. The flight path between the two cities has been searched by both radar and cell phone. No flight plan was filed, making it more difficult for crews to narrow the search area. Officials say the aircraft Emergency Locator Transmitter made intermittent transmissions. The Idaho Civil Air Patrol and the Valley County Search and Rescue conducted searches by air and ground. 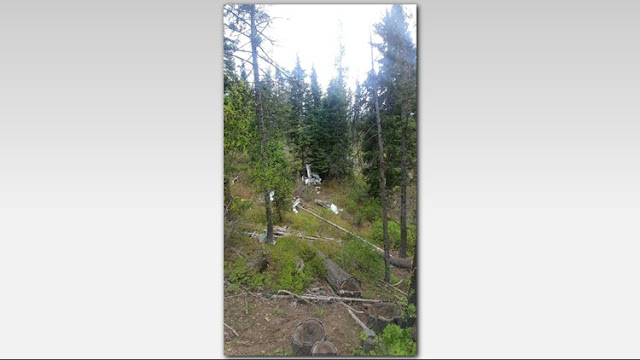 The wreckage was found by the Civil Air Patrol Monday afternoon north of Banks. Investigators with the NTSB and the FAA will now take over the scene and investigate the crash. Valley County Search recovered the body of 34-year-old Nolan W. Smith of Boise on Monday, May 14, after his small airplane went missing Sunday, reported the Valley County Sheriff in a news release. 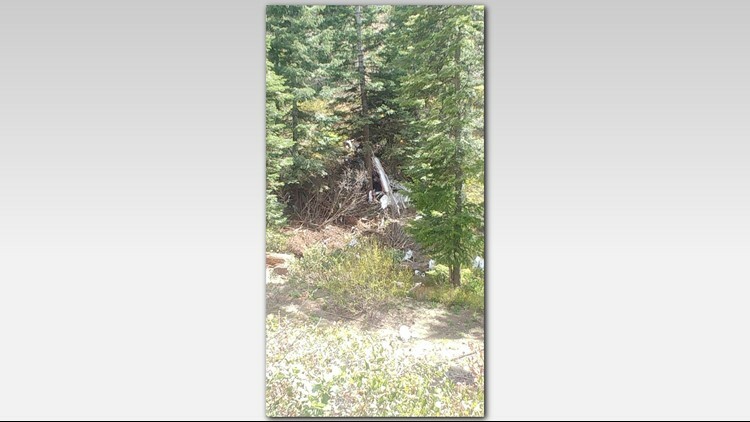 Smith's Cessna 182 was found in the Boise National Forest southeast of Cascade, east of milepost 93 on Idaho 55. Smith took off from the Boise Airport on Sunday, May 13, according to an Idaho Transportation Department press release, and never arrived at his destination at the McCall Municipal Airport. The report came in about noon Sunday. Smith did not file a flight plan, which complicated search efforts, said Idaho Transportation Department spokesman Reed Hollinshead. Initially, cellphone data pointed to Boise County, but further information from the emergency locator transmitter in Smith's plane led searchers to Valley County. Searchers on the ground located the plane with support from Civil Air Patrol. As a former aviation safety professional, it troubles me to hear of aviation fatalities. This one is especially so, since I had met this nice young man several years ago. I hope his family takes comfort in knowing he left us doing what he loved.